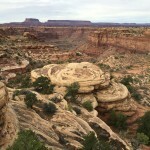 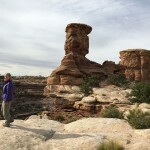 We decided to check out the Needles District of Canyonlands National Park for a few days, a two hour drive down UT 191. 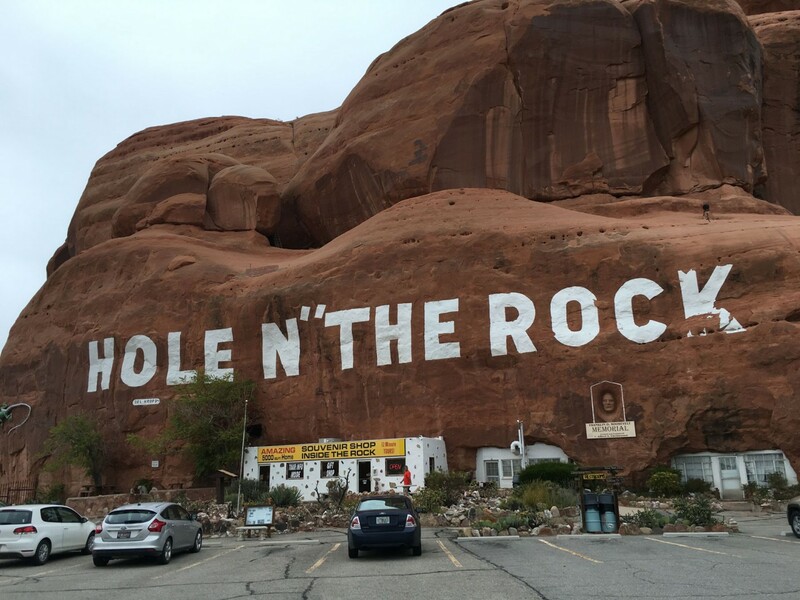 The drive to the Needles is round-about, heading south then veering sharply north through a long steep walled red rock canyon. 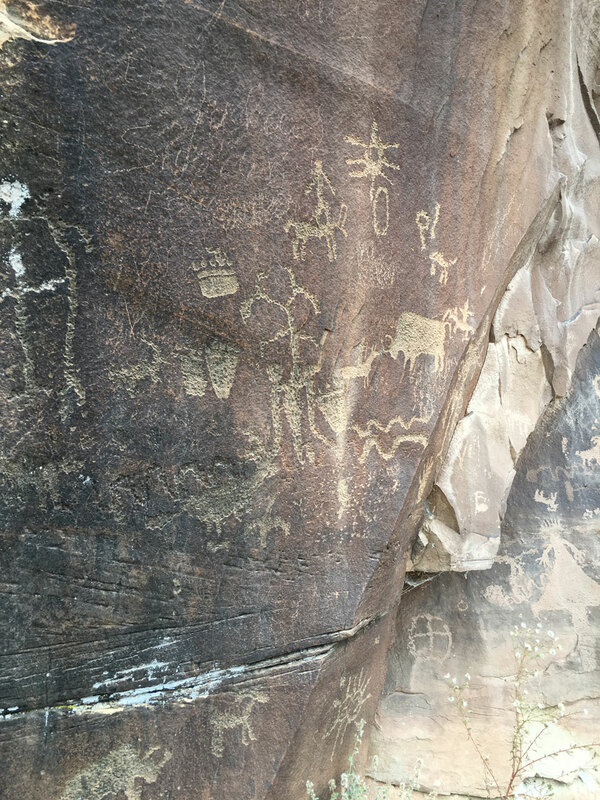 We pulled over at Newspaper Rock to see the many centuries worth of petroglyphs that adorn this once-popular “signpost”. 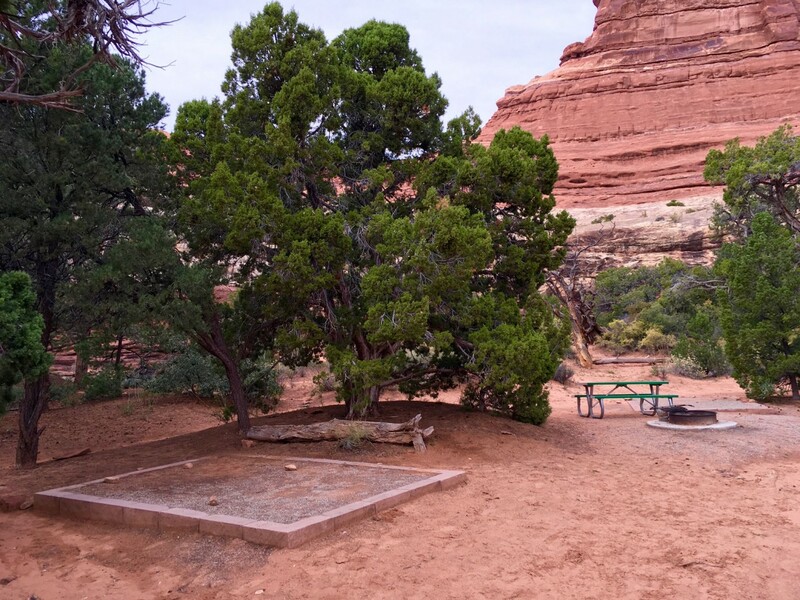 At the Needles Visitor Center we inquired about availability in the Squaw Flats Campground (yes). 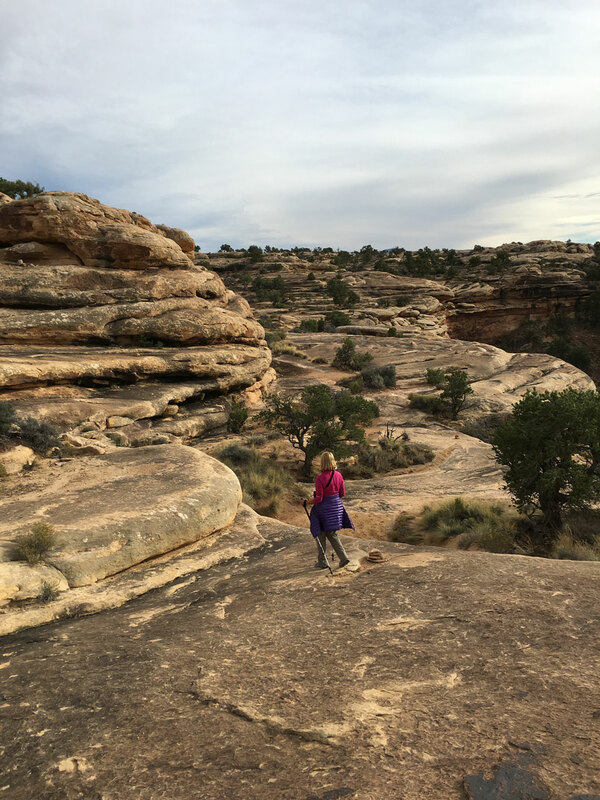 While chatting with the ranger, a large raven repeatedly and aggressively attacked one of the nearby windows. 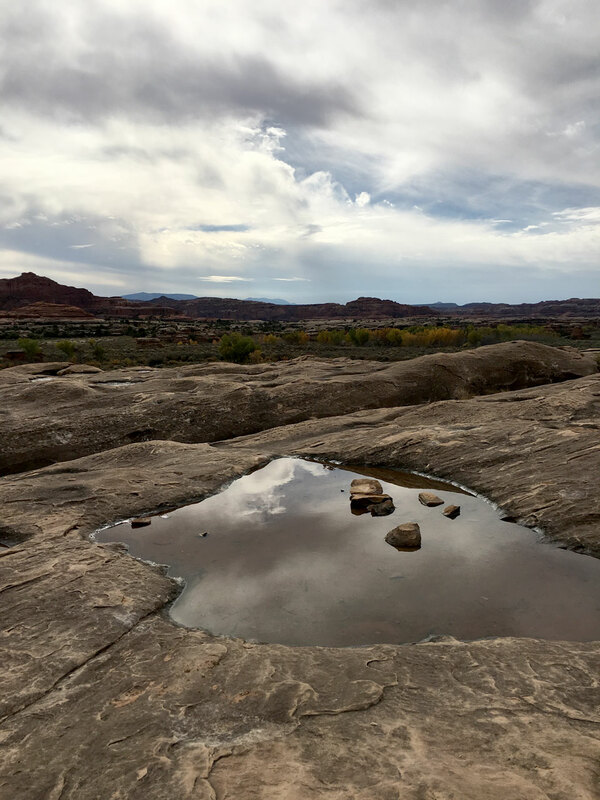 It turns out that every day for the past two years, when seeing his reflection, he spends the day registering his dislike at the same scarred panel of glass. 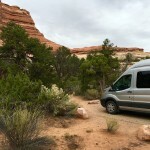 We drove on to the campground and found a very nice spot (#15) at the back of the “A” loop. 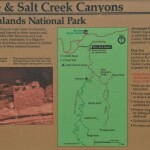 Then we took off for the Big Spring Canyon Overlook to see what we could see. 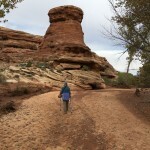 We took a short hike on the Slickrock Trail on the way back. 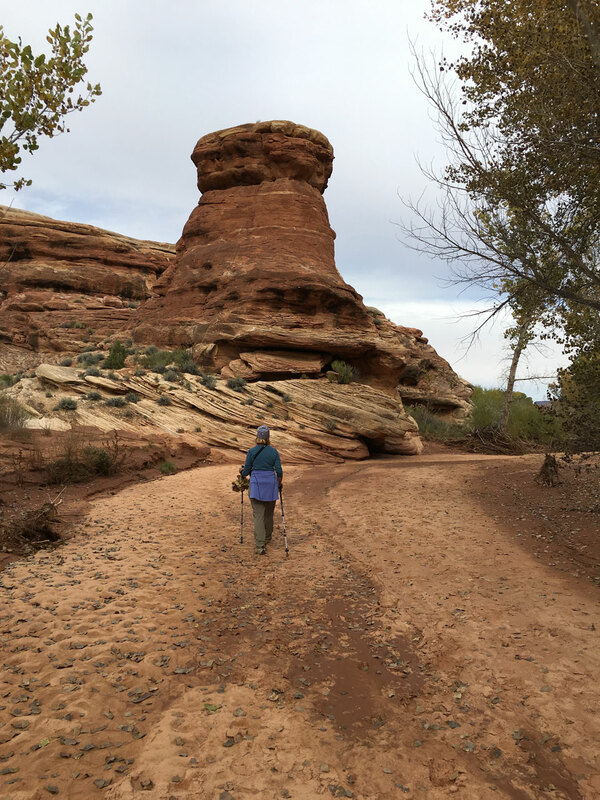 “Slickrock” is a bit of a misnomer as the sandstone rocks are not at all slick, which is good since the whole trail was on the rock itself. 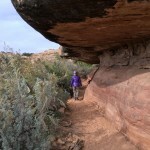 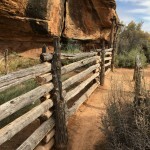 The trail winds its way out to a high tan-colored mesa that separates the Big and Little Spring Canyons. 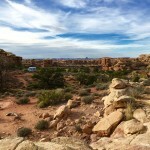 We could see the Colorado river valley far away in the distance. 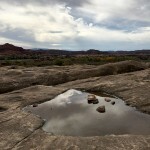 The surface of the rocky plateau was dotted with lots of pothole puddles still filled from recent rains. 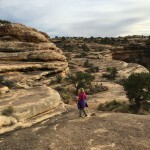 It was a relatively easy 3-mile hike and then we returned to camp for dinner. 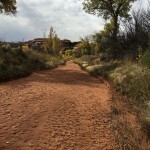 The next day, we decided to give the narrow dirt road that leads to Elephant Hill a try. 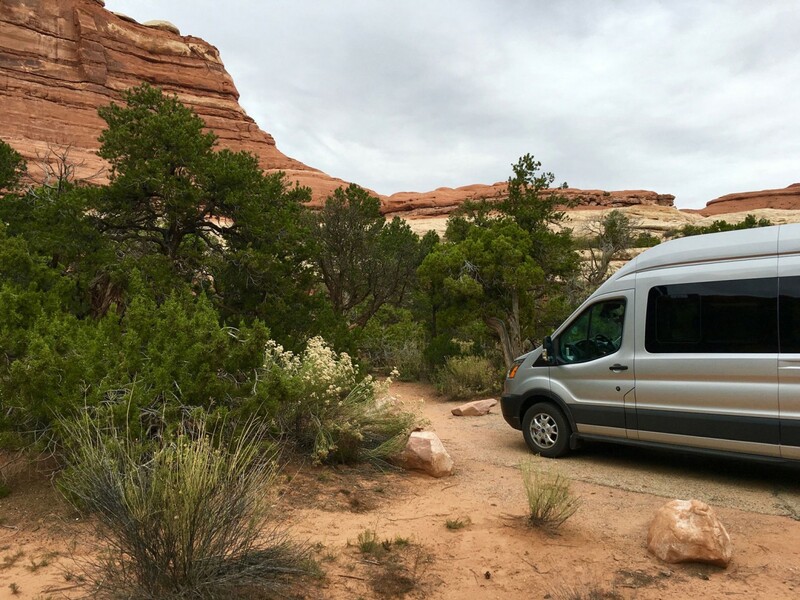 Turns out the van, and driver, did very well negotiating the tight, blind curves to the petite parking area at the foot of the 4×4 track, one of the most technical four-wheel-drive roads in Utah. 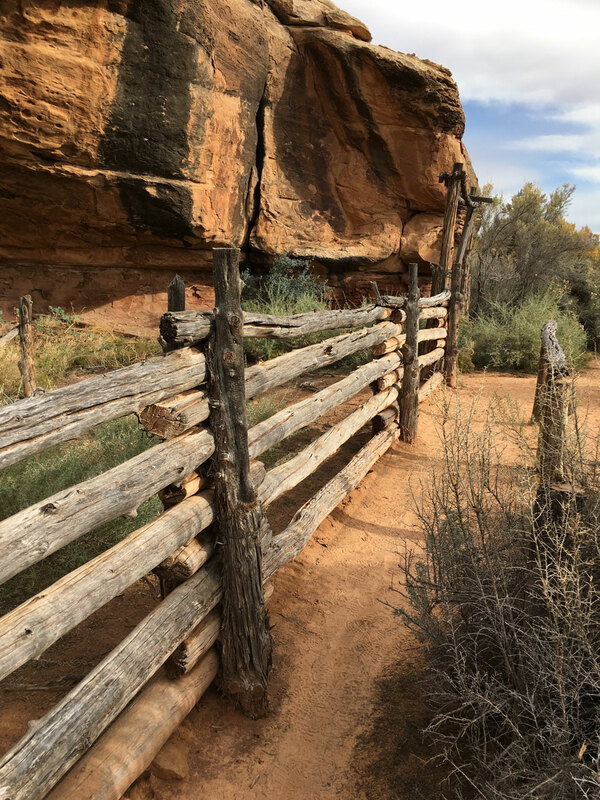 It was a little early (and chilly) for a canyon hike, so we opted to continue driving to see some of the other sites in the area. 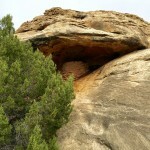 First stop was Cave Spring, a former cowboy camp tucked under the base of the mushroom-like rock formations. 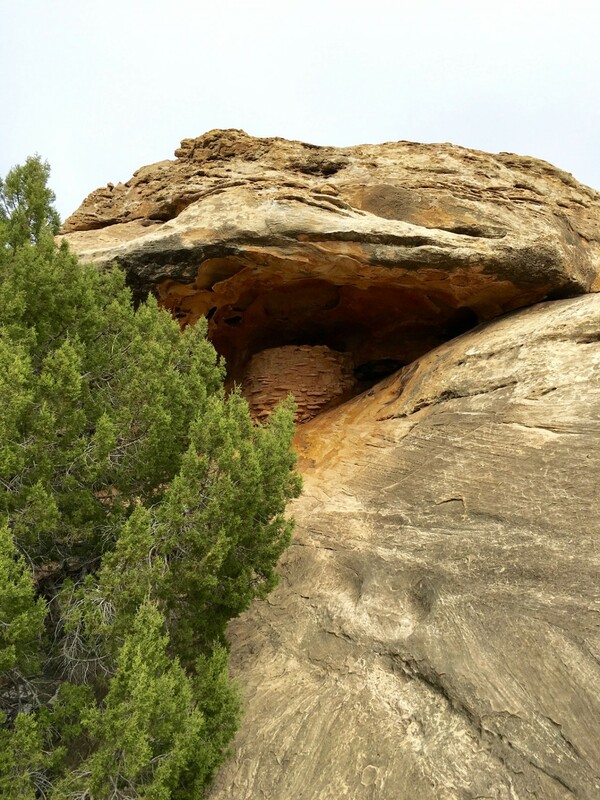 Generous overhangs provided great shelter to both Indians and cowboys alike. 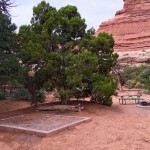 Today, there’s a well-preserved camp setup including work benches, cabinets, cookware and horse corral. 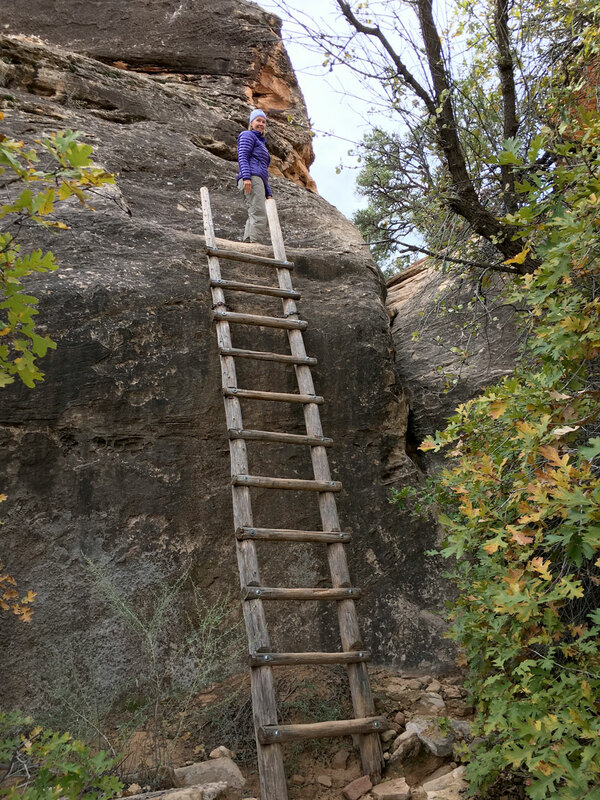 The hike takes you past the camp and then up a ladder to pass over the rocks and then back down to the camp from the opposite side. 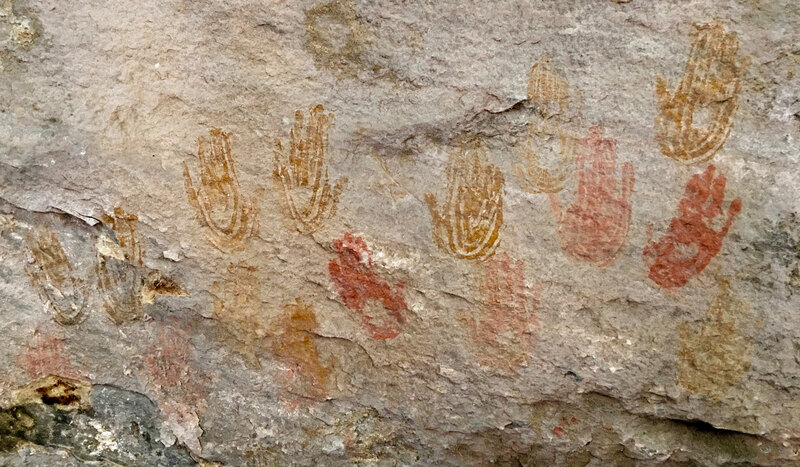 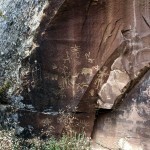 There’s also a set of beautifully graphic hand prints left behind by Indians centuries ago. 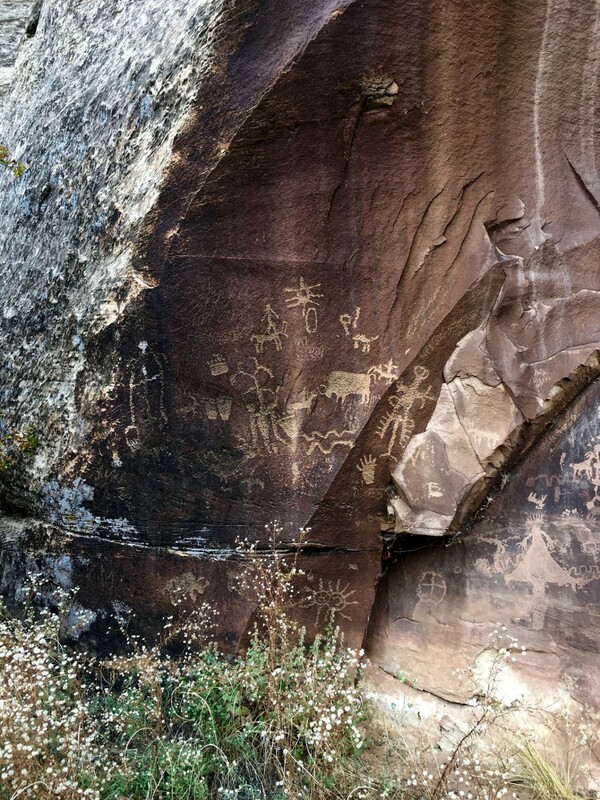 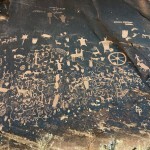 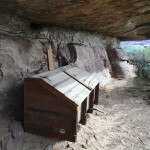 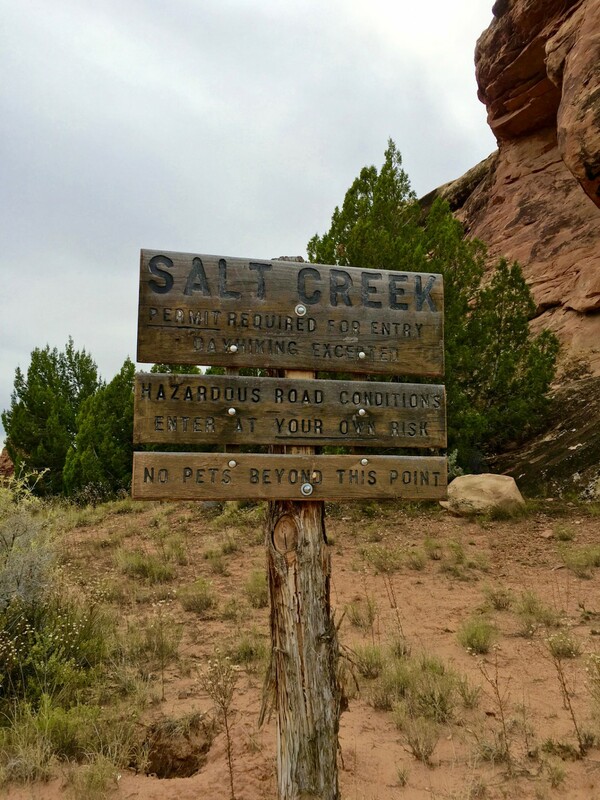 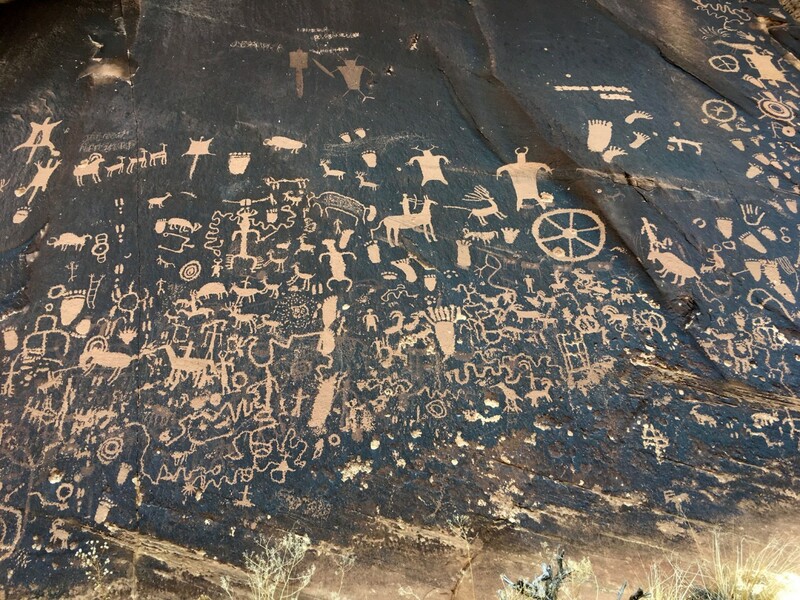 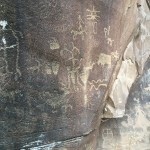 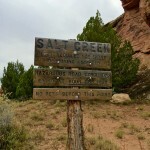 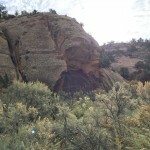 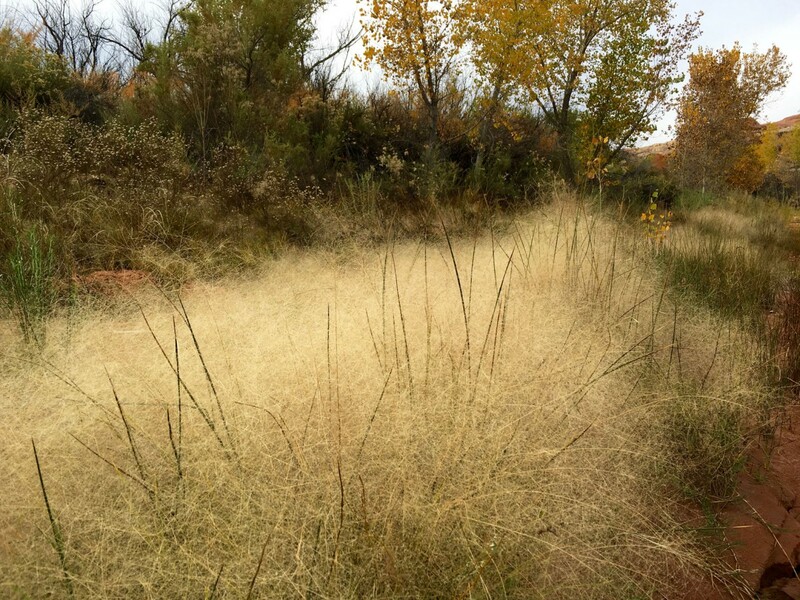 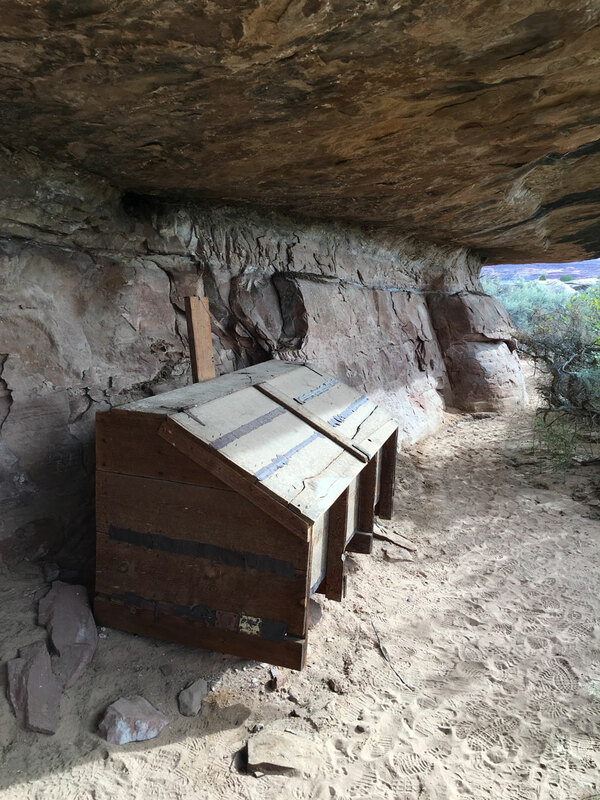 We drove a short distance to the trail head for Salt Creek Canyon, which promised petroglyphs and native ruins. 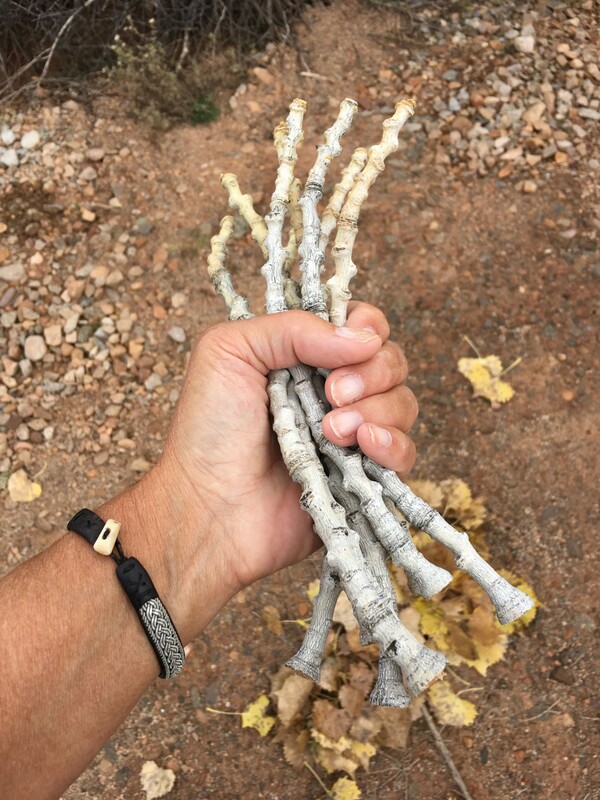 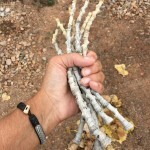 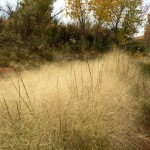 Sadly, we weren’t able to spot any as we hiked for two miles up the mostly dry wash lined with willows and cottonwoods. 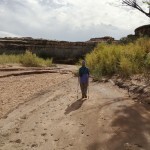 However, David’s shoe managed to locate a patch of quicksand in the wash.
We also checked out the Roadside Ruin which featured a short walk out to an ancient hidden granary. 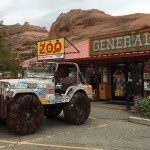 With the weather threatening to turn very wet, we decided to turn back and return to Moab for the night. 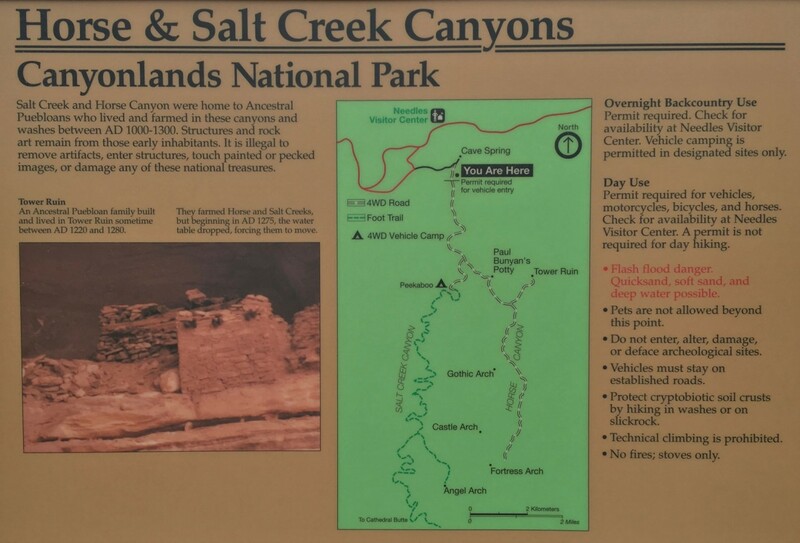 On the return trip, the red rock canyon looked very different, much more imposing. 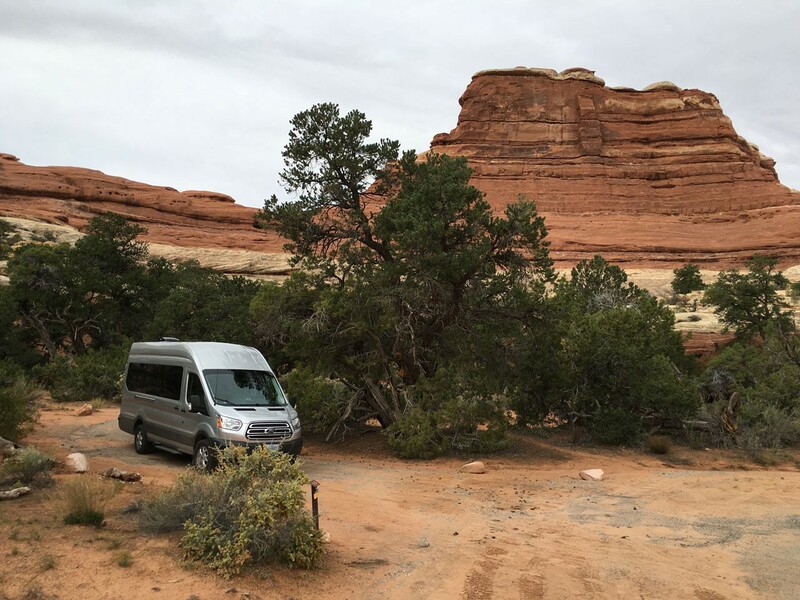 We noticed clusters of vans and cars parked in groups along the roadside. 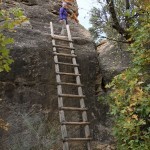 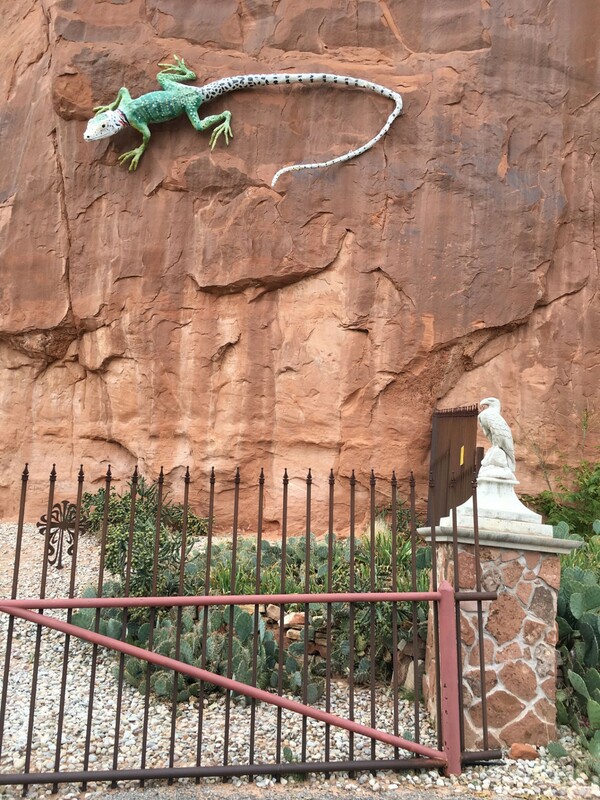 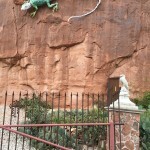 Chris spotted the tiny, brightly-clothed rock climbers festooning the tall cliff walls. 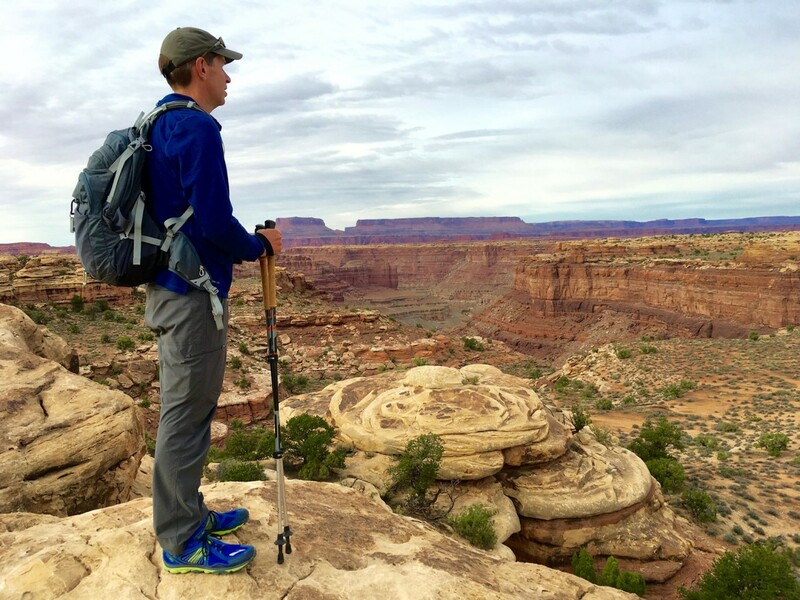 Without binoculars, you’d never know they were there. 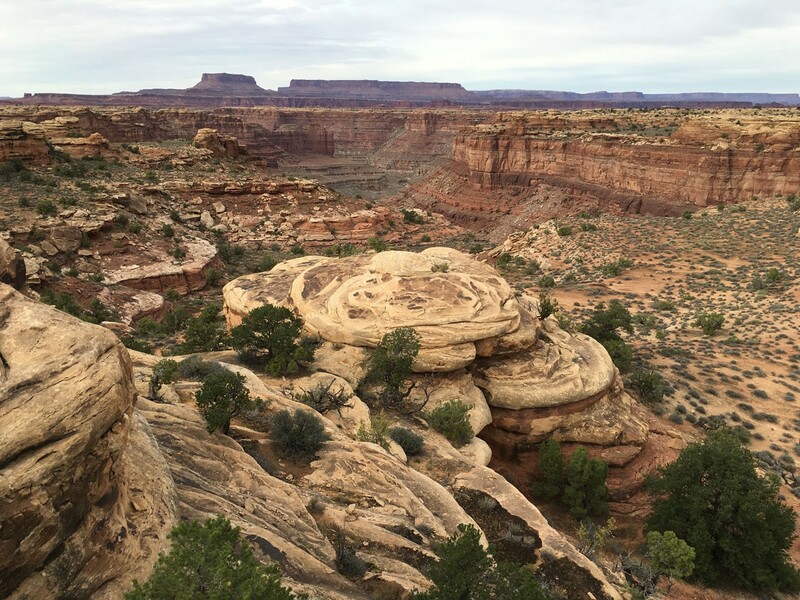 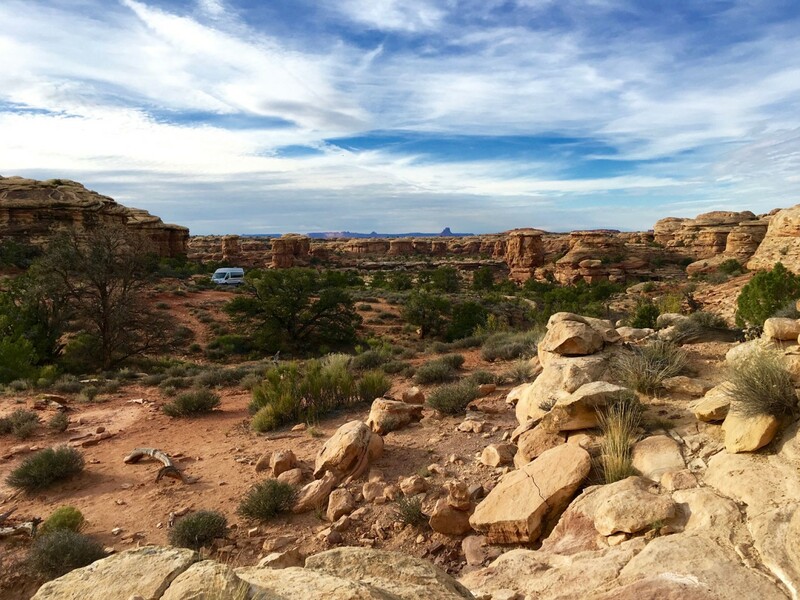 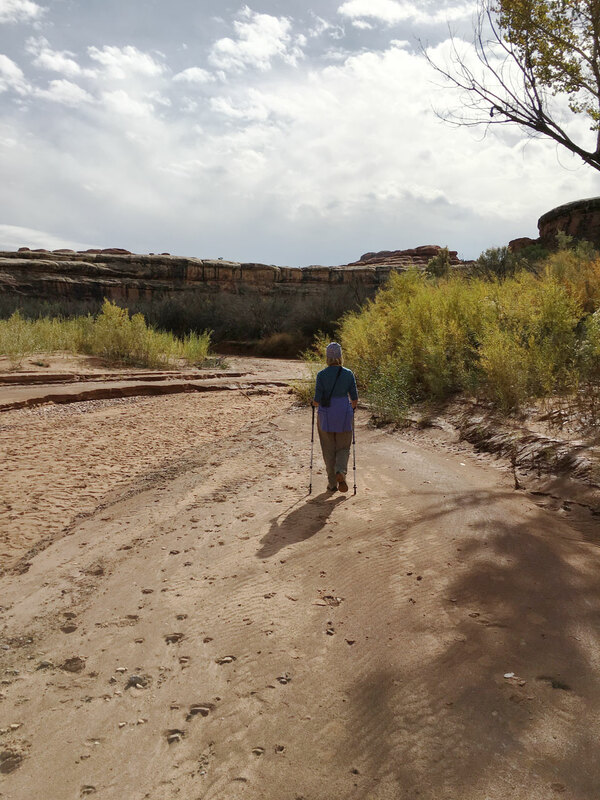 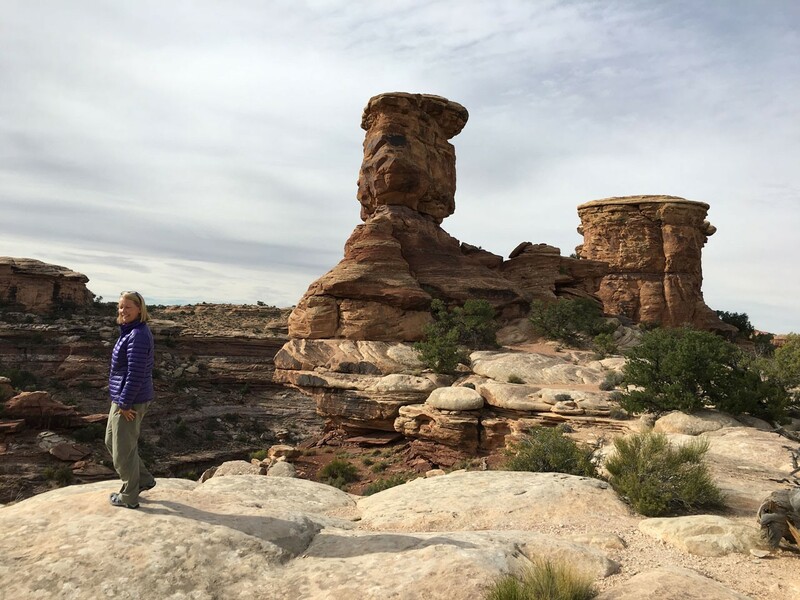 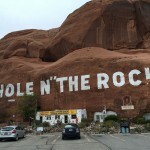 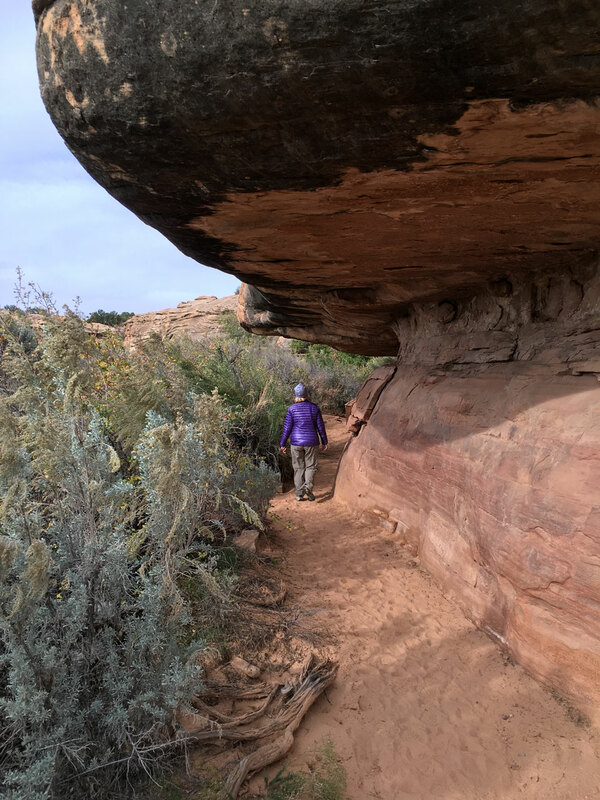 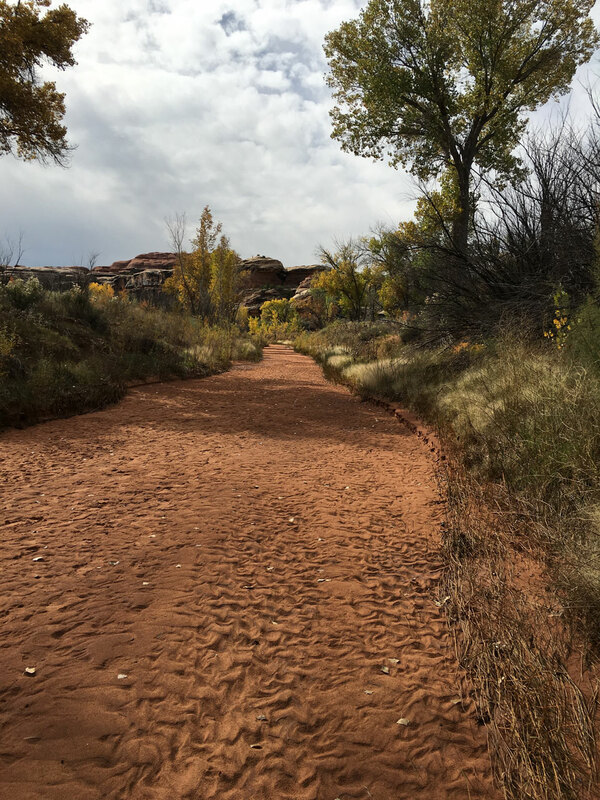 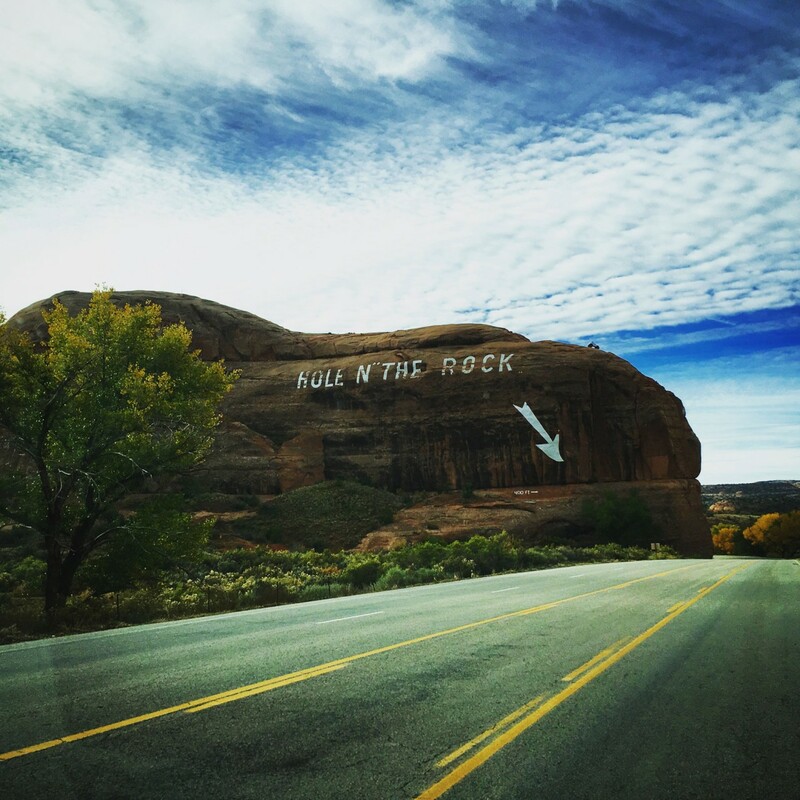 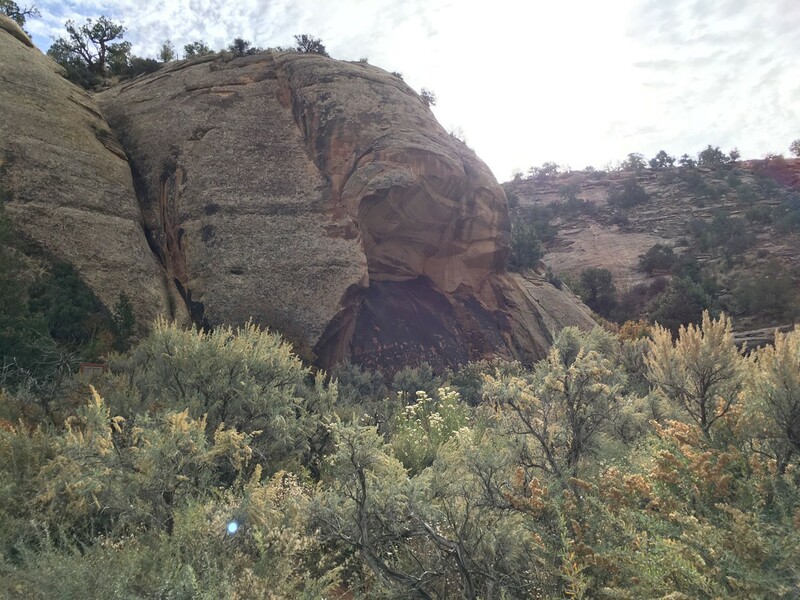 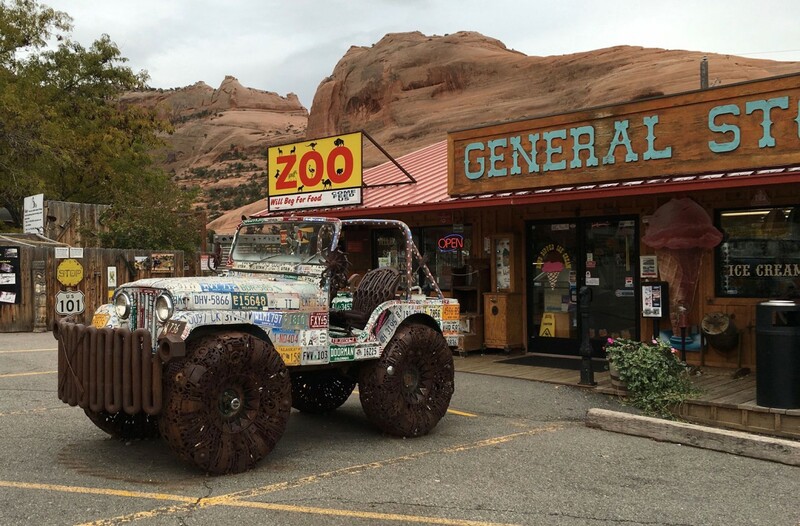 A one-of-a-kind tourist destination, Hole In The Rock, sprouted from the red sandstone just south of Moab, so we checked it out on the return trip to Moab. 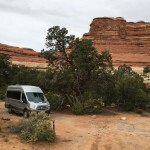 Which we did… but didn’t leave the van.